City folks can be bird watchers. 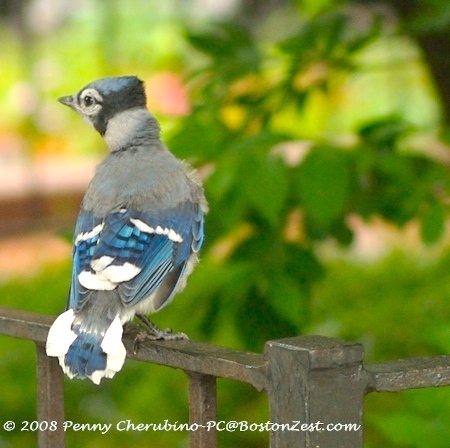 Today I found this baby Blue Jay on a wrought iron fence, in the heart of the Back Bay on Beacon Street. Saturday was the first full day of summer, and the weather provided a perfect evening for patio dining. 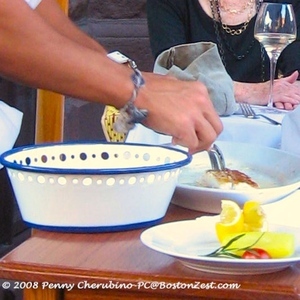 We took a walk on Newbury Street and sailed into an outside table at La Voile. Since our 2008 New Year's resolution has been to drink more sparkling wine, we thought we would expand our first day of the month quest for bubbles to include the first day of the season. 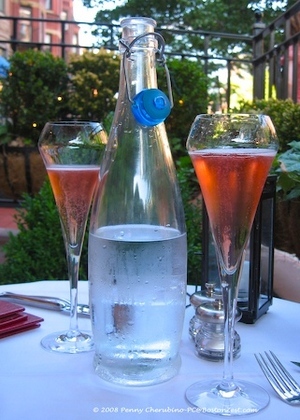 We began the evening with a bottle of Cremant de Bourgogne Brut de Charvis Rosé. With Champagne prices rising as our dollar becomes worth less, we have been buying more Cremants and enjoying them. This one is a tad drier than the one La Voile had been serving and that was fine with us. The staff added an amuse of leek soup and saucisson along with warm bread for nibbling with the wine. The wine went well with the amuse, but it really shined with my main course. 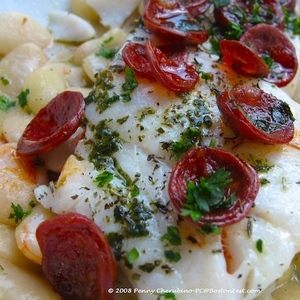 I have been stuck on the cod with chorizo and beans that has been a staple of the La Voile spring menu. I know I should order other items when I dine here, but I adore the cod, and inevitably it will disappear. Until it does, I'm eating it often. 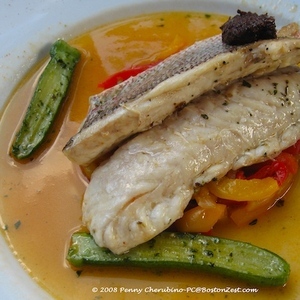 Ed ordered the snapper with pepper coulis. He ate all of his and the last third of mine. Both dishes were very good. Dining greatness came at dessert. Ed is probably bored splitting this dessert with me but, I adore the warm chocolate cake that the chef has had on the menu since our first visit. The chocolate is of top quality, the cake is baked to runny; gooey perfection and there is always a divine ice cream (topped with a chocolate sail) to complement each spoonful of cake. Sorry, but in the presence of this decadence, I forgot to take a photo. I guess I'll have to find someone to accompany me some afternoon to order the cake and photograph it. This is a great spot for watching the passing parade on Newbury Street. We were also treated to the show of a tableside de-boning of a neighboring diner's dinner. In a neighborhood full of chain restaurants, food factories, and just a few hidden gems, La Voile has sailed into our hearts. We feel welcome, we are treated well, they seem to care about the neighbors and we always leave relaxed and happy. What more can you ask of a neighborhood spot? This has been a Chowhound favorite with a few dissenters to give you other views. Here a Chowhound search for you to review. 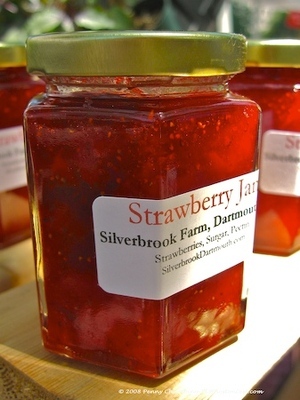 Sometime farmers' markets can simply be a place to see beauty – like this sparkling jar of strawberry jam from Silverbrook Farm. 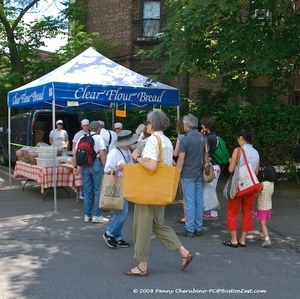 I just heard through www.Chowhound.com that they have some strawberry rhubarb jam so I'll be looking for that on Tuesday at Copley Square. As days grow warmer, residents shift walking routes to find cooler paths to their destinations. Some of Boston’s best shade is the deep canopy created by tall heritage elms in parks, along streets, and in yards throughout the city. 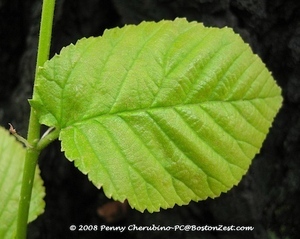 Here's a photo of an elm leaf to help you identify these special trees. Every Spring, people strolling on Commonwealth Avenue see workers, hired by the Mall Committee, inoculating elms against Dutch elm disease. Those little plastic vials, encircling the base of trees, contained a systemic fungicide. Inoculation is a costly step in a year-round effort to prevent the destruction of elms. A large tree costs nearly $500 per year for this treatment which must be repeated every spring. With state land abutting city land it’s important that the state is also inoculating against the disease. 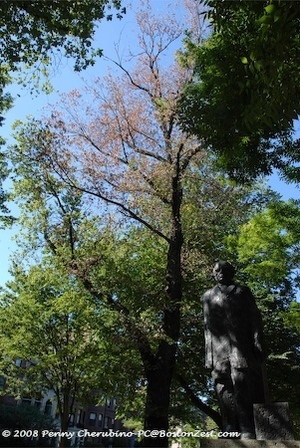 “We do have about 35 elms that we have identified as worth saving in the urban parks area,” said Wendy Fox, press secretary for the Department of Conservation and Recreation. Some of those elms are on the Esplanade and in the Charlesgate parks. Anyone who cares about trees, can join the watch to detect early signs of the disease. Spring is a good time to identify elms. The elms were the trees dropping the small, translucent circles with a visible seed inside. You know the ones- they float down like dry tan snowflakes and collect in gutters, on stairways, and on your dogs. When we have a few days of hot weather, the elm bark beetle will come out of hiding and begin spreading the disease. That’s when volunteers look to the treetops for signs of distress. “We call it flagging, which is the yellowing of the leaves on a certain section,” said Greg Mosman, Boston’s city arborist. If you spot this symptom or see yellowed leaves falling from an elm before foliage season, call the “Parks Line” at 617-635-7275. A detailed description of the location of the tree will bring out an expert to test it and determine a course of action. Sadly, this may require the removal of the tree. “Sanitation and making sure that we eradicate the disease is what it is all about,” said Mosman. He explained that the possibility of the disease spreading is his worst case scenario. Below is a photo of a tree that is pretty far along in the disease. Feel free to report much less damage than this. Efforts were made to save this one, but it did have to be removed to protect the trees around it. Two elms on the Mall were saved in 2007 because the disease was caught early enough to remove a portion of the tree and save the rest. 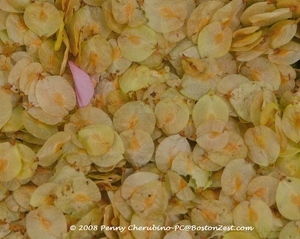 Twelve elms had to be removed from the Boston Common in 2007. More volunteer eyes are needed there to provide early warnings. 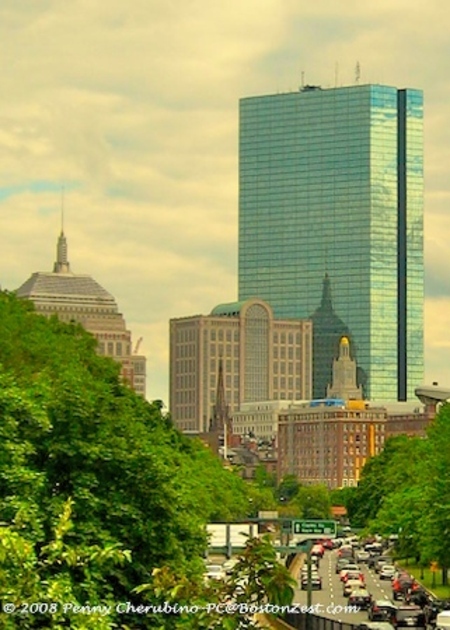 The latest report on the Commonwealth Avenue Mall’s trees is a good one. “In the 1960s, over half of its 600 trees were either dead or dying.” “The restoration was completed ... with the planting of 30 disease-resistant elms,” said Margaret Pokorny, chair of the mall committee. Now, when you see those curious little vials around the trees, you’ll have a better understanding of the process. And, the next time you take a walk in the shade you’ll be able to look up and check on the health of the trees and call in a report if necessary. If you would like to learn more about the history of elms, I recommend this book. 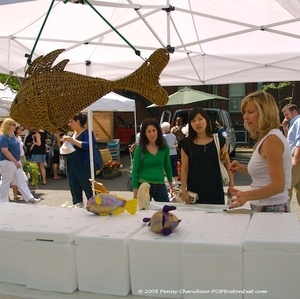 Today was the first Brookline Farmers' Market of the 2008 Season. Clear Flour Bakery had lines most of the day. 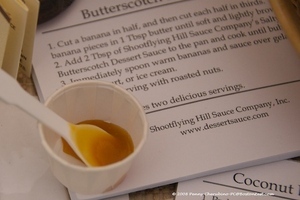 Thanks to the crew over at the Boston board of Chowhound.com, I sampled the Salty Butterscotch Sauce from Shootflying Hill Sauce Company and decided it would be too dangerous for me to take it home without a dinner party scheduled to use it up. I fear I would sit with a spoon and eat myself into a salty-sugar daze. 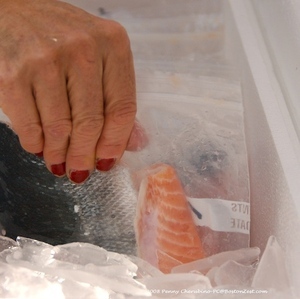 And, the "Fish Lady" was on hand with a lovely assortment of very nice looking seafood. I signed up for her e-mail list and will report later on how that works. 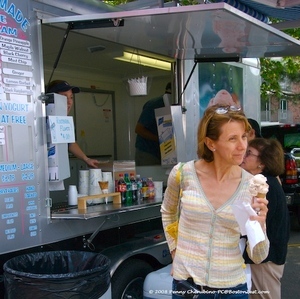 For the latest, inside information on what is happening at area markets, visit the weekly topic on Boston's Chowhound.com site. Also check in with www.massfarmersmarkets.org. You can sign up for their newsletter on the homepage. 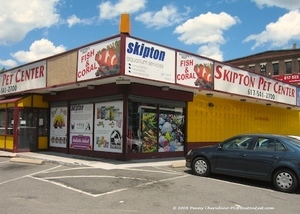 Skipton Pet Center Has Been a Big Help to Us. Last year our Westie, Maggie Mae had a long running case of colitis. She had several trips to the veterinarian with medications for one week then two weeks at a time. We started to make homemade food for her in the hope of finding something that would help. Finally, we listened to our friend Liz who had been quietly recommending that we "Go talk to Allison at Skipton." I grabbed a Zipcar and made the trek down Mass Ave. I told Allison what was happening, and she walked the aisles of dog foods with me, reading ingredients and talking about various options. She finally recommended Artemis Fresh Mix and said to just switch over that night. Within a day, Maggie Mae was back to normal and hasn't had a problem since. She also suggested buying a couple of flavors of Wysong Uncanny freeze dried food and Wysong Dream Treats for times when Maggie Mae gets sick of the same-old-same-old and needs something to perk up her appetite. Again she was right. It's good to have someone in the pet food business who knows her stuff and is willing to take time with customers to help solve their problems. I went to Skipton today to stock up on Maggie Mae's favorites and heard that Allison was out sick. Allison, get well soon, we need you healthy on hand to keep our companion animals healthy! And, if you are a carfree city dweller, Skipton delivers!